Whether they are parrots or Pekinese, turtles or tomcats, our pets hold a special place in our lives. They provide companionship, ease our loneliness, warm our feet at night. They can be a sportsman's companion or a family's protector. They are the loves of our life. 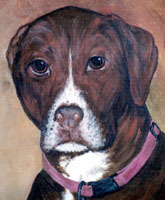 The artist can capture the likeness of a special pet. She can portray the unique character of your animal in his natural surroundings. From photos, she can recapture the likeness of a lost companion. She can transform a collection of snapshots into a lasting, tasteful portrait.